Available to fit either "Straight" or "L Shaped"
e.g. 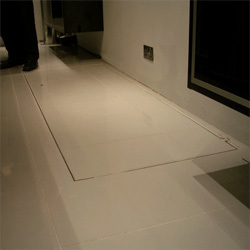 tiles, carpet, timber flooring etc. 2.4m x 800mm in size. 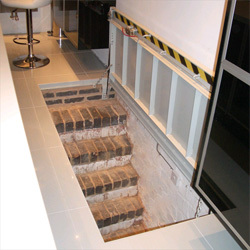 The staircase door is designed to operate with either "Straight" or "L Shaped" flights of stairs. Both styles of staircase doors can either have the Tray Type Door application applied so a matching floor finish can be applied or inserted to match the surrounding area. 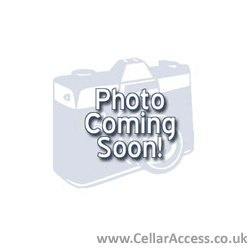 Different frame types are also available to accommodate your particular opening edge detail. A self opening system is standard on both shapes of staircase doors either using a gas strut and tee handle release approach or electric actuator(s) with a hard wired control switch or a wireless remote control. All steel construction and painted to your specific RAL paint number or supplied colour sample. 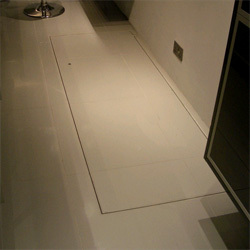 Only the hinges, a 6mm door edge and a 6mm frame edge is visible when the trap door is closed. Concealed hinges can be specified if required. 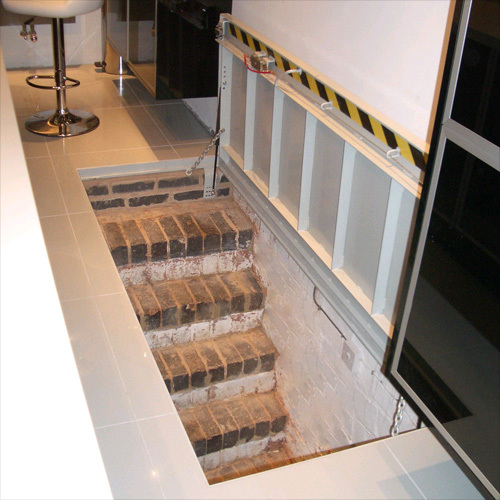 This style of trap door is perfect for replacing a balustrade around the top of stairs in an apartment or house with a cellar / basement. 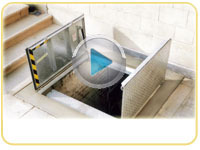 This can add a much greater usable floor space and in some cases increase property value.